Insert Clocks are ready to install and include dial, hands & clear glass or plastic covers. Clocks Mount from the Front and Can Be Removed for Battery Access. Warranted 12 months. Quantity discount pricing available. FITS OPENINGS that are at least 1/4" deep. FRONT of Clock Is 1-7/16" Diameter. Bright Gold Finish Plastic Bezel. White dial with black hands. Stainless steel back. Easy Press In Installation. Includes Battery. Non-Alarm. INSERT FITUP CLOCKS for 2-3/16", 2-1/2" & 3" Diameter Openings. Easy Front Mount. Bright Gold Finish Plastic Bezels. Quartz-Accurate. Non-Alarm. 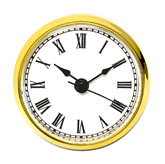 INSERT FITUP CLOCK FITS 2-5/16" to 2-3/8" ROUND OPENINGS that are at least 1/2" deep. FRONT of Clock is 2-7/8" Diameter. Gold Finish Plastic Bezel. Easy Press-In Installation. Non Alarm. Uses AAA-size battery - not included. FIT 3" ROUND OPENINGS that are at least 5/8" deep. FRONT of Clock Is 3-1/2" Diameter. Bright Gold Finish Plastic Bezels. Easy Press In Installation. Non-Alarm. Uses AA-size battery - not included.